With a large percentage of the MLM underbelly on board, in order to survive the next few months USI-Tech needs to convince regular investors to get on board. This has seen the company forced to try to address the question of where its ROI revenue comes from. Since May USI-Tech has been promising proof of external ROI revenue, yet in the secret “thou shalt not record” affiliate meetings the company holds around the world, all affiliates have gotten is promises of this and that. First it was forex trading, then it was bitcoin trading, then it was bitcoin mining, then it was magical energy devices and now, out of nowhere, an ethereum mining pool named “USITech” has surfaced. 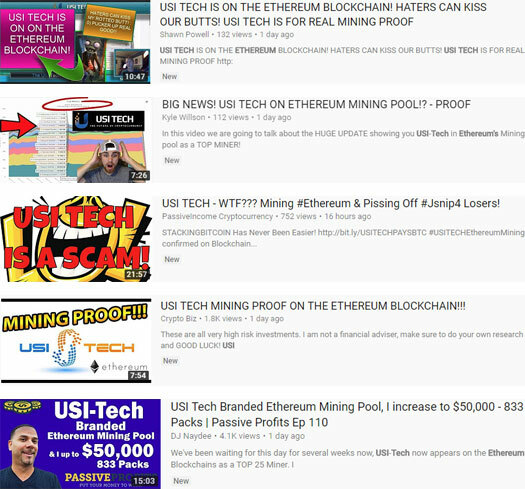 A few days ago USI-Tech affiliates began spamming EtherChain’s top Ethereum miner charts all over the internet. As above the charts show a mining pool named “USITech”, corresponding to the account “0x625a083Bee9E6F0FD756e79880b26B955826702c”. Putting aside the fact that anyone can create or buy a mining pool and call it whatever they want, let’s take the USITech named pool at face value and accept it is actually owned by USI Tech. According to Etherchain, the USITech mining account was first seen on May 1st, 2017. Word on the grapevine is the USITech account is just an existing Chinese ethereum mining farm the company recently purchased, however I was unable to independently verify these claims. The USITech account has, as at the time of publication, been mining for 221 days and accounts for approximately 0.59% of the global ethereum hash rate (mining power). Those are the facts pertaining to the USITech ethereum mining account (which may or may not be owned by USI-Tech). Now lets dig deeper into the financial numbers. As you can see in the screenshot above (blue circle), to date the USITech account has mined $8,461,586.36. Before we go any further, let me break down what that means. The theory behind all these EtherChain mining chart spam is that it’s proof that USI-Tech is generating external revenue (we’ll address why that’s not the same as audited accounting later). In order for this to be so, USI-Tech would need to be transferring ETH out of the USITech mining account in order to pay affiliates. 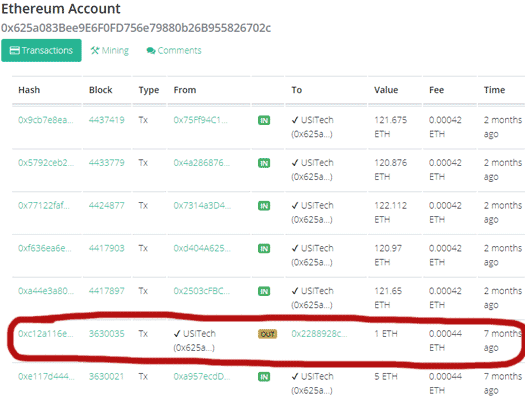 As the transaction history for the USITech account shows, no ethereum has left the account since 1 ETH was transferred out seven months ago. Ergo even if we play along and accept USI-Tech owns the USITech mining account, they have not been using mined ethereum to pay affiliates a 1% daily ROI. Even without the transaction history though, this should be already blatantly obvious. The USITech account to date has only mined $8.4 million worth of ethereum. Current USI-Tech affiliate investment numbers are unknown, but in late September co-founder Horst Jicha claimed the company had taken in around €350 million EUR. Let’s be conservative and reduce that to $300 million. USI-Tech’s business model sees the company promise a 140% ROI on €50 EUR investments. €300 million in investment from their affiliates equates to a €420 million EUR liability. And remember, we’re using a conservative investment amount and totally ignoring referral commissions. If USI-Tech completely drained their $8.4 million ethereum mining pool (€7.14 million EUR), that leaves €412.8 million EUR in ROI revenue unaccounted for. And that also requires the assumption that USI-Tech used the ethereum mining profit to pay affiliates with, of which there is absolutely no evidence of. Regardless of whether you’re a realist and see an ethereum mining pool as meaningless without audited accounting showing generated profits are being used to pay affiliates, or you’re part of the Ponzi gullible and take everything at face value, the assertion that ethereum mining is being used to fund USI-Tech affiliate ROI payments is impossible. So with respect to the USITech mining pool account, where to from here? Over the last few days the USITech account has mined 146.7, 74.47 and 178.1569 ETH. That comes out to an average of 133.1 ETH a day, which at the current exchange rate is €79,814.96 EUR. A €420 million EUR ROI liability backdated to September would take 5262 days to pay off. A far cry from USI-Tech’s “140% in 140 days” marketing pitch. And bear in mind that’s only if you froze new investment into USI-Tech and the value of ETH itself, neither of which has happened. 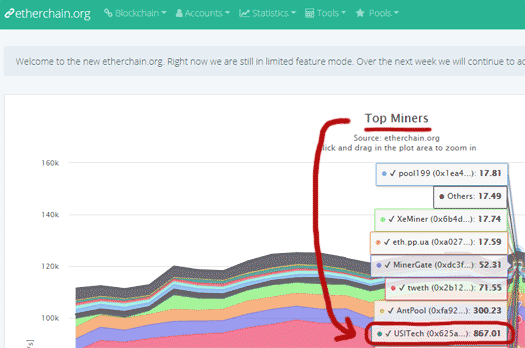 Time to face facts: The USITech mining pool is nothing more than the latest attempt in a long list of failures by USI-Tech management to feign legitimacy. USI-Tech is not generating external ROI revenue through stock trading, bitcoin trading, bitcoin mining, $70 million dollar contracts with Genesis Mining, magical free electricity devices, ethereum mining or anything else they come up with. 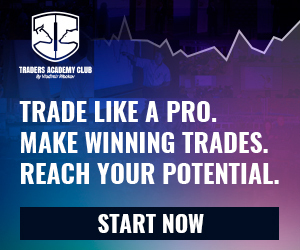 The only verifiable source of revenue entering USI-Tech is new affiliate investment, the use of which to pay existing affiliates a 140% ROI makes it a Ponzi scheme.